Courtneylove EXCLUSIVE: Eighteen months after becoming the first major celebrity sued for defamation on Twitter, Courtney Love is finally scheduled to sit for what could be one of the wildest depositions of the year. Judge Debra K. Weintraub has issued an order requiring the firebrand rocker to appear for her deposition on Sept. 28 and respond to paper discovery requests by Sept. 14 in her ongoing dispute with fashion designer Dawn Simorangkir (aka Bourdoir Queen). Attorneys for the two sides worked out a schedule that wouldn't conflict with Love's tour (she's been in Japan and Europe all summer), and the judge issued the order late last month confirming the dates. 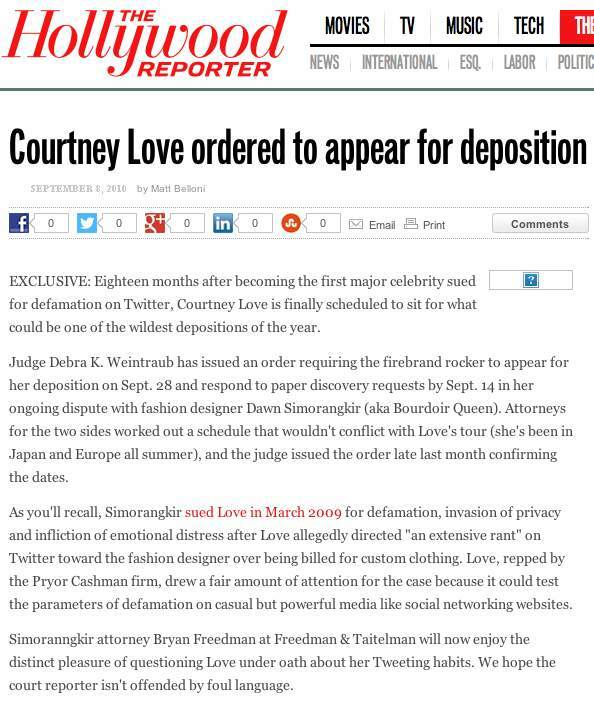 As you'll recall, Simorangkir sued Love in March 2009 for defamation, invasion of privacy and infliction of emotional distress after Love allegedly directed "an extensive rant" on Twitter toward the fashion designer over being billed for custom clothing. Love, repped by the Pryor Cashman firm, drew a fair amount of attention for the case because it could test the parameters of defamation on casual but powerful media like social networking websites. Simoranngkir attorney Bryan Freedman at Freedman & Taitelman will now enjoy the distinct pleasure of questioning Love under oath about her Tweeting habits. We hope the court reporter isn't offended by foul language.